This is why I love Wes. Because he can send me this photo, with a dead-pan expression of complete seriousness. All of you should know that Wes DOES NOT sport a mustache. Although, ironically, he usually has a face full of black, two-week-old beard. So to see him clean shaven with a FAKE mustache was so funny to me. I swear to him that he is a bowler hat and pin-striped-three-piece-suit away from looking dapper. (Look, his top button is even done up. Tee hee.) It was "Mustache Day" over at that crackpot school he attends, AFI. I mean, what do they think they are over there—a bunch of filmmakers?! And Wes, darling, please don't hate me for posting this photo of you. I couldn't resist! Oh wait. That's right. You are too busy to read this blog anymore. What do you think you are doing for 15 hours a day—applying yourself?! 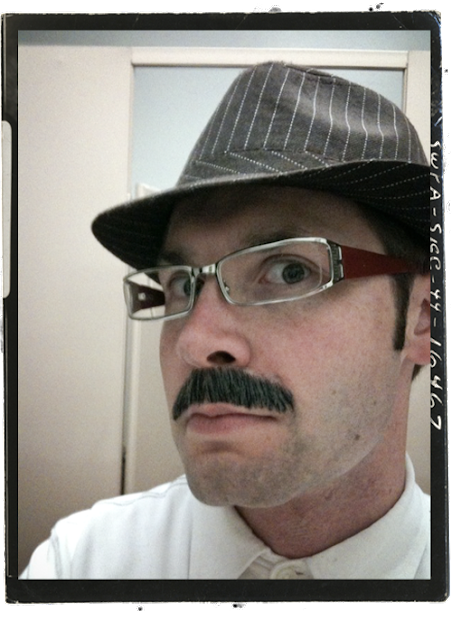 POST EDIT: When Wes saw this he said "People are too scared to comment..."
wes, you look like a private eye. and is that a bathroom stall I see in the background?